Before the Halloween last year, the Jordan Brand made waves with the release of Air Jordan 2 “Candy Pack”. And this year, the famous shoe brand is looking to make noise once again with the release of another candy pack. But this time, the Candy Pack will be used in the Jordan CMFT Air Max 10, a shoe that also had good sales during its previous releases. The new Jordan CMFT Air Max 10 will be released in Kelly/Kelly-Black, True Red/True Red-Black-White, and Tour Yellow/True Yellow-Black-White colourways. 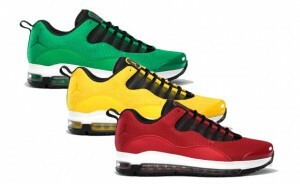 Featuring a combination of the Air Jordan X and Air Max 97, these three editions is a must for you sneaker-lovers!